Harvest season is almost a magical for me. I love to watch as my pantry shelves slowly fill with jars of all shapes and sizes and colors. It makes me feel “warm and cozy” inside. It’s kind of therapeutic. I have to admit that once all my “staple” canning and freezing gets done I like to make my “special” pickles and relishes. 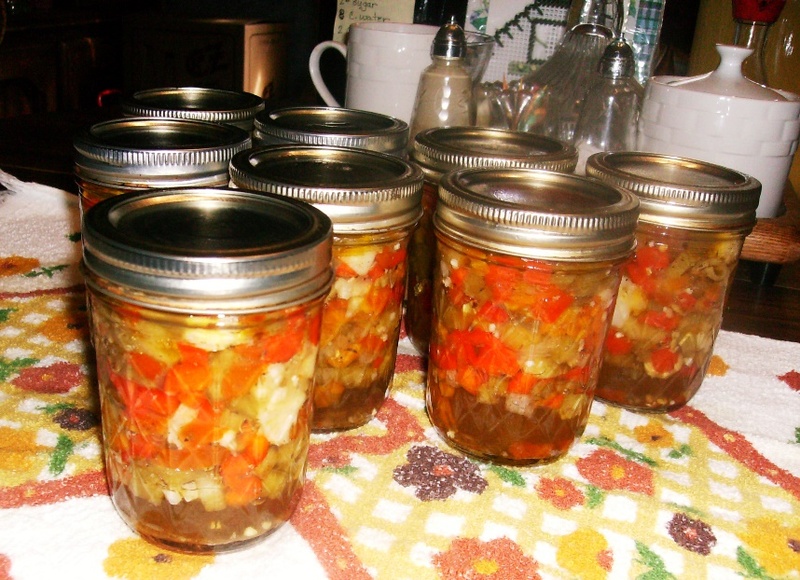 On the menu this harvest season is Giardiniera, a wonderful savory mixed veggie relish. This year I had a nice crop of Greek oregano that I dried so I will be using that even though Giardiniera is traditionally Italian. Note: I found that pressure canning will cause the veggies to lose their crispness. Now I hot pack this and store in the fridge once cooled. If you make a half batch it stores well in the fridge in a covered container and tastes great even raw. Experiment! Send me your feedback I’d love to hear from you! Submerge veggies below salt water, cover and refrigerate 24 hours. Drain water. Mix well, cover and let marinate for a few hours. Transfer to large pan and bring all ingredients to a boil. Pack into hot 8 oz jars and wipe rims well. Seal jars with hot lids. (I cheat and use my dishwasher sanitize cycle to get my jars, rings and lids hot.) Store in fridge once cooled. Makes 9 cups. I have a hard time introducing new foods to my husband. He’s very fussy and is usually sure he won’t like anything unfamiliar so I thought I’d give my traditional Vegetable Fried Rice recipe a little makeover. I use organic ingredients but that is just my personal lifestyle preference. This dish is suitable as a side dish or if you used the vegetable broth option, suitable as a vegan main dish. In a large skillet brown Quinoa in sesame oil. Add stock and soy sauce and simmer until liquid is absorbed. 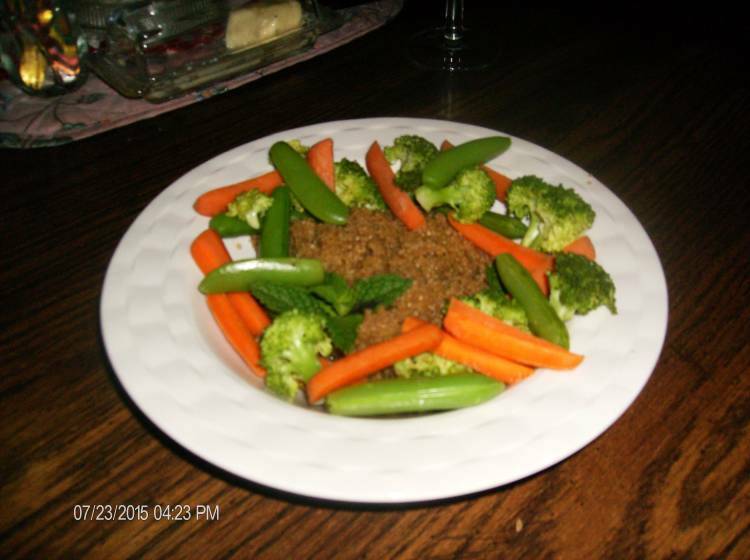 While Quinoa is simmering, in separate sauce pan, steam pea pods, celery, carrots and broccoli. Put Quinoa in a bowl and arranged steamed veggies around the edges. Top with slivered almond is desired, QUICK, EASY, NUTRICIOUS and DELICIOUS! BAM!